Your circadian rhythm and sleep homeostasis work together to balance the quality and quantity of your sleep. Sleeping well is a delicate combination of internal and external factors that are easily put out of balance. The circadian rhythm is governed by the external environment, in particular the light and dark cycle of the sun and the moon. The brains internal clock associated with the circadian rhythm is located in the hypothalamus. An important function of the hypothalamus is to link the nervous system to the endocrine system via the pituitary gland. It regulates emotions and is associated with memory. If the nervous system is under extreme stress, it’s likely to affect the circadian rhythm. Getting stress under control is fundamental for addressing a sleep issue. The circadian rhythm regulates many things including sleeping and eating patterns, core body temperature, brain wave activity, hormone production and cell regeneration. If your circadian rhythm is out of balance, it’s likely that your mind will be racing constantly. Cortisol is also affected by the circadian rhythm, it decreases later in the day, and increases early hours of the morning so that you have enough energy to get you through the day. If it’s increasing too much due to stress, it will affect your ability to fall asleep in the evening. Serotonin is largely produced in the enteric nervous system in the gastrointestinal tract, but it’s also produced in the brain. Serotonin regulates anxiety and happiness and is connected to your circadian rhythm. It also has very important functions in the digestive system. 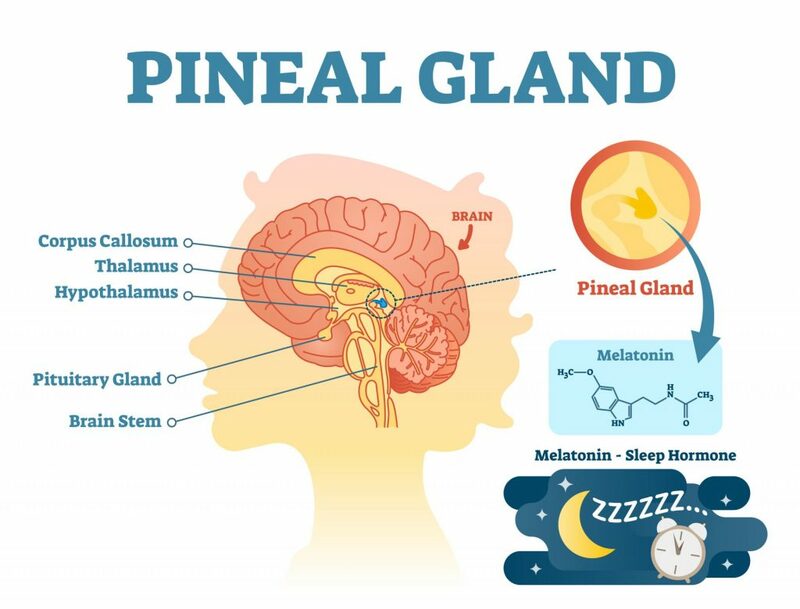 Melatonin, your sleep hormone, is produced by the pineal gland from serotonin. It causes drowsiness and lowers the body temperature. Sleep homeostasis is your internal timer. It generates a pressure for the need to sleep. It relates to the time that passes since you had your last adequate deep sleep. The longer you’re awake, the stronger the need and desire to sleep becomes. The longer you’ve been asleep, the pressure to sleep will disappear. This pressure to sleep is caused by Adenosine. Adenosine is a chemical message carrier. During the course of your day Adenosine is produced. Over time it starts to inhibit the production of serotonin, your daytime hormone. It’s also connected to the amount of energy you’ve used up during the day. As your energy stores become depleted, Adenosine increases. When you go into deep sleep, the adenosine starts to reduce and your energy reserves are topped up. Stimulants such as coffee, tea and energy drinks work as adenosine antagonists and affect your ability to fall asleep. Sleep homeostasis is connected to deep sleep as opposed to dream sleep. The pressure to sleep is derived from the need of deep sleep. It only reduces, therefore, during deep sleep (non REM sleep), not dream sleep (REM sleep). If you’re not getting enough deep sleep, you’ll constantly be feeling the pressure to go to sleep, even if you can’t sleep. Sleep inertia is that early morning grogginess you feel when the alarm goes off if you get woken up out of deep sleep, Adenosine may not be fully dissipated and all you’ll want to do is go back to sleep. However, if you wake up from light sleep, you’ll feel fresh and rested on waking. During the night, you’ll go through 4-5 sleep cycles composed of light sleep, dream sleep and deep sleep. You’ll get most of your deep sleep early on in the night, however if you’re in a deep sleep early morning when the alarm goes off, you’ll find it difficult to wake up. This is why getting into a rhythm is important to enable you to go through the various sleep cycles at the right time. If you go to bed and get up at the same time every day, your sleep cycles will balance so that you wake up from light sleep refreshed rather than deep sleep and suffer from the zombie sleep inertia state for at least the first half hour of the day.